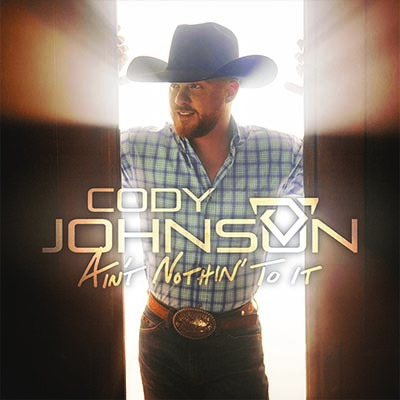 Cody Johnson is probably one of the best Country neo-traditionalist artist of his generation. ''ain't Nothin' To It'', his brand new album prove it one more! One of the best country album I heard from the begining of this year. When Cody Johnson’s Cowboy Like Me debuted in the Top 10 on the Billboard Country Albums chart in January 2014, jaws dropped in offices all over Nashville. Johnson delivers it all with an uncanny confidence. His smoky baritone and ultra- Southern enunciations give him a voice as uniquely identifiable as country kingpins Jason Aldean or Tim McGraw. And he uses it to convey a Texas-proud swagger, a real-man charm and an unwavering honesty about who he is, where he comes from and where he hopes to go. The hard-workin’ part is key. The other parts are easily found in his music. It’s intense, focused, sincere. And when he takes the stage, there’s a Garth-like conviction to his performances. Johnson inhabits the songs, recreates their emotions because they’re so familiar. And he’s willing to lay bare those emotions because he’s always been willing to risk. He lives in the moment behind that microphone, the same way he rode bulls in an earlier day. Johnson pauses for just a beat. always another buckle to chase, another bull to conquer for eight seconds. In the latter, there’s always another fan to win over, another song to write. And in some ways, Johnson has been chasing something illusory, indefinable, since he first arrived on planet Earth in Southeast Texas. Johnson grew up in tiny Sebastopol, an unincorporated community on the eastern shore of the Trinity River that’s never exceeded 500 residents. Even today, it’s more than 30 miles to the nearest Walmart, in Huntsville, Texas, a town best known as the headquarters for the state’s criminal justice department. It’s a rough and tumble area, and it comes through in the music. Willie Nelson, Merle Haggard, George Strait, Billy Joe Shaver – their songs were all essential to the local clubs, and Johnson was exposed to their mysterious allure even before he was old enough to get in. At a young age, Johnson was given the tools to eventually work in those clubs, though his official education was grounded in the church. His father played drums for their congregation, and that was likewise the first instrument that young Cody picked up. Johnson learned guitar next, and when a teacher heard him playing an original song, he convinced Johnson to form a band with a few other students enrolled in the Future Farmers of America. Just a few months later, that first band finished runner-up in a Texas State FFA talent contest, creating an internal buzz that Johnson would continue to chase. He didn’t necessarily think it would be a career. He briefly went to Angelina College in Lufkin, Texas, but traded that in to become a rodeo pro. Johnson did OK in that sport – the oversized belt buckle he wears today was won fair and square on the back of a bucking bull – but he broke a litany of bones: his right leg, his left arm, two ribs and his right collarbone. Cody started recording his own music during that phase of his life, beginning with Black And White Label, which featured his dad, Carl, on drums. Johnson sold the CDs, pressed on his own CoJo imprint, from his pickup. Eventually, Cody took a job at the prison to pay the bills. His band kept hitting the clubs on the weekend, with Johnson banging away on the guitar on Fridays and Saturdays while overseeing some very hardened convicts whose crimes had cut them off from humanity. Meanwhile, his weekend crowds began to grow, and Johnson started landing hits on the Texas music charts. After the release of his third album, he won New Male Vocalist of the Year in the Texas Regional Radio Music Awards. The music thing started to look like it could be a business, not just a sideline pursuit. He was stunned when his wife, Brandi, agreed. Even with her belief, the road wasn’t easy. Johnson reached a new creative plateau when he enlisted singer/songwriter Trent Willmon, who wrote Montgomery Gentry’s “Back When I Knew It All,” to produce an album in Nashville. That project, A Different Day, raised the bar on Johnson’s barroom ambitions. The studio musicians he worked with challenged his own band. Johnson grew – and his bandmates grew – because they had to stretch themselves to live up to the album on the road. That pattern has continued through three projects as he continues to chase something illusory. “It’s that always-never-good-enough kind of attitude that gives us that drive,” Johnson says. When Cowboy Like Me broke onto the Billboard chart, it demonstrated that they had built an audience, but also gave them a little cache to push it even further. Fast forward to today and Johnson is selling out venues in over two dozen states in such far-flung destinations as California, New York, Montana, Wisconsin and the Southeast. He consistently wins over fans with his honest songs and on-stage ferocity. Johnson has built a social media following of more than 750,000 fans. Impressive numbers for a guy who’s marketed and developed his career without the aid of a major label-- that is, until the recent announcement of his partnership with Warner Music Nashville (June 2018). In essence, Gotta Be Me documented the life of a guy who’s lived in the fast lane as a beer-drinkin’, rodeo-ridin’ cowboy, but who’s also seen just enough darkness to temper that wild streak. “You’re only a couple bad decisions every day from screwing your whole life up,” he reasons. Johnson seems destined to make that mark. Gotta Be Me landed at No. 1 on the iTunes Top Country Albums chart, No. 2 on the Billboard Top Country Albums chart and No. 11 on the Billboard 200. With an independent catalogue five albums deep and nearly 300 million on-demand streams accumulated largely in the last year and a half alone, Johnson has established himself as an industrious and talented Nashville staple. Billboard declared earlier this year, “Cody Johnson is the real thing,” while Rolling Stone Country boldly claimed that Johnson, “finds himself rapidly hurtling toward mainstream stardom with a unique concept in his arsenal: actual country music." Johnson has introduced himself to fans around the nation through years of extensive and successful touring, becoming the first independent artist in history to sell out RodeoHouston at NRG stadium earlier this year at nearly 75,000 tickets. From one corner of the country to another, the entertainer has sold out shows in more than two dozen states. In 2017 alone he sold over 350,000 hard tickets and hasn’t slowed since, having launched a nationwide tour in April that will continue through the summer. Now part of the newly minted CoJo Music / Warner Music Nashville, Johnson will join the WMN radio team and is preparing to release new music later this year.